TFC Family Fun Night Out at the Dallas Stars Game!!! 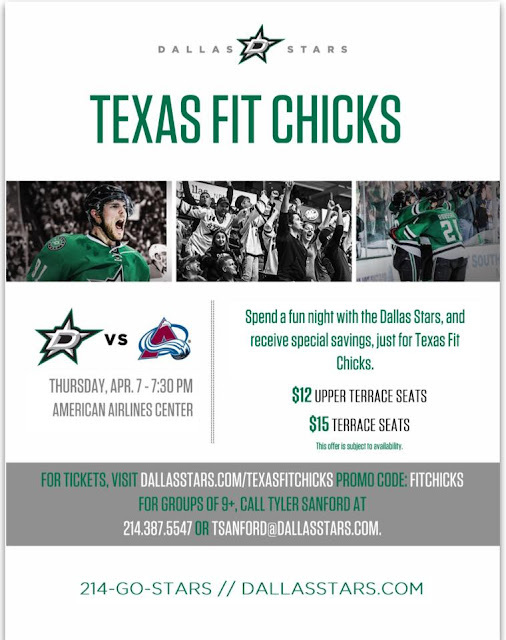 We are pleased to announce our FIRST EVER Texas Fit Chicks family night out!! Come join your fellow DFW area trainers & chicks and their families for some good ole family fun! Thursday, April 7th at Dallas Stars vs. Colorado Avalanche. Get your TFC DISCOUNTED tickets (only $15 a regularly $35!!) at www.dallasstars.com/TexasFitChicks and use promo code FITCHICKS to pick up tickets for you, friends, and family! Come join in on the fun with your fellow TFC friends and let's pink out (or black our for the boys) the stadium while cheering on our Dallas team on their final push to the playoffs! 10 Powerhouse Foods That Will Help You Burn Fat! !